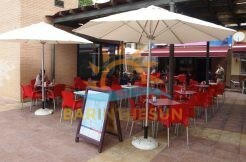 Cafe bar for sale in Torremuele, Benalmadena, Malaga on the Costa del Sol in Spain. 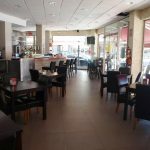 This desirable cafe bar is very fairly priced and offers a desirable corner trading location within a large urbanisation midway between the holiday resorts and coastal towns of Fuengirola and Benalmadena, this established popular bar enjoys a good regular trade form the locals and multi national residents living permanently in the surrounding area, this desirable easily managed café bar is also within a short stroll to the beach and within close proximity to a large hotel and holiday apartments that helps to ensure the bar also receives a good share of the ever present tourist sector, the bar enjoys a steady footfall of passing trade from early in the morning until late in the evening. 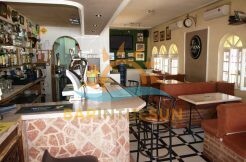 The interior of this cosy cafe bar is approximately 35 m2 with seating for around 16 comfortably, the serving bar is a nice working size and can easily be managed by one person if required, there is a purpose built rear gantry for displaying a good selection of wines and spirits, the bar is in good decorative condition throughout and will only require new owners personal style and theme, the business is being offered fully furnished, equipped and as a turnkey business where new owners will be able to commence trading with the minimum of fuss or effort, included are a varied selection of pictures which may help our clients gain an insight of the style and layout of the business. 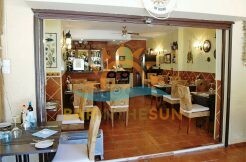 The separate kitchen area is located via an archway at the end of the serving bar, this kitchen facility has an industrial extractor with filtration and complies with the latest licensing laws and regulations required by premises that cater with food to the public sector, the kitchen although small is furnished and equipped with a selection of commercial appliances to cater for the typical style café bar menu. 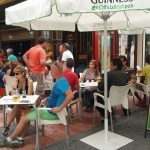 The exterior terrace area of the bar is approximately 30 m2 with seating for around 32 comfortably, this valuable terrace area offers a good corner location that enjoys steady pedestrian foot fall from early in the morning until late in the evening, during the warm sunny days the owner puts out umbrellas for client wanting some shade while enjoying their favourite tipple or a tasty snack.